We received recently several requests from our users, about sending messages as PDF attachments in Mail Merge Toolkit, and typing the text for the message body – so, we will answer them in our blog for all our customers who are interested in using this efficient feature. When I use this on my Word 2016 it asks me to type my message in a “Message Body” box after I do the step of adding the attachment. Why does it ask me to do that when I’ve already typed it into the main doc?? 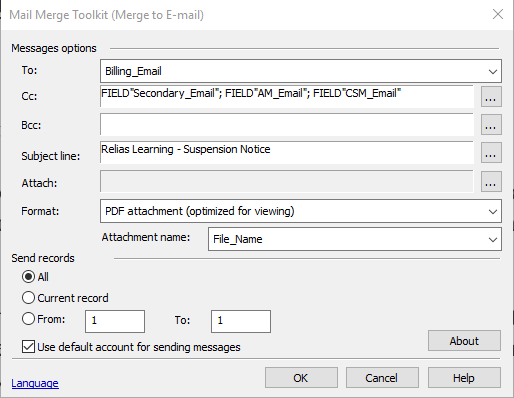 If you select “HTML/RTF/PDF Attachment” as the message format in the Mail Merge Toolkit settings, your main Word document will be converted to a file, and attached to each outgoing personal message as personal separate file (and the same for Publisher projects). Originally, that “Message body” box supported merely plain text and macros (Merge data fields), but later, we also added support for images and other graphic objects – your message body can look now like your regular message, with pictures, tables and formatted text. And together with the attached message file, you can also attach regular files to your mail. 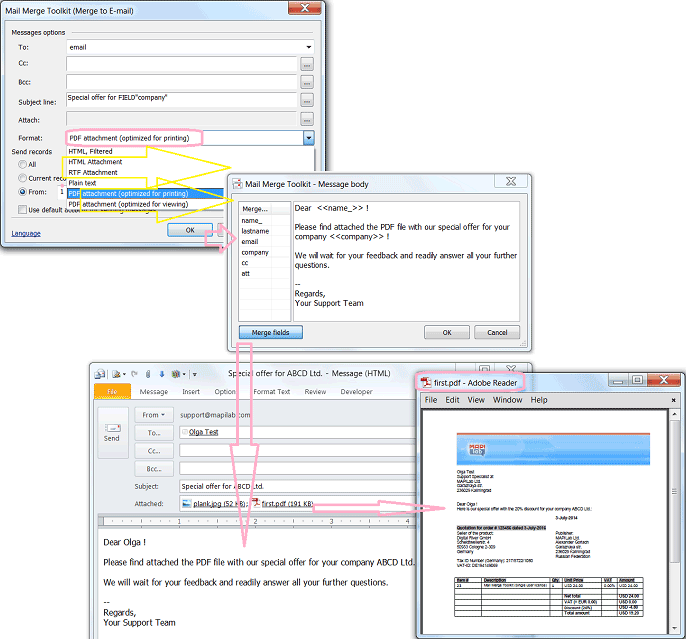 When sending a customized PDF attachment, a box opens to input the email message body with optional mail merge fields. This message always seems to be in HTML format. Is there a way to change it to the other formats, such as plain text or RTF? HTML is the only supported message format if you send your main document content attached as PDF, RTF, or HTML file. We started using it, because this format is universal and supported by all e-mail systems and clients. The last sentence is wrong. HTML is not universal nor fully supported by all email clients. That is plain-text, which should be an option for the mail format. Frankly, from a programming standpoint, doing a plain-text email body is far simpler than HTML! Hello Robert, thank you for your note ! It’s a pleasure for me to read it: text is the best and the most reliable human communication method. From cuneiform to ICQ, the role of writing in the history of our civilization can scarcely be overestimated. But most people prefer sharing images with their respondents, as well as using different fonts and colours in their messages. Therefore, plain text is not the only format we support – we have to support other message formats too, including HTML, RTF, PDF and even GIF (in Publisher). When I am using the extension to microsoft word, I find that half of my email addresses are skipped? When I manually send to each of the skipped addresses they go through without issue. But when I try to bulk email the address are skipped. Is there a way to fix this? Please make sure that the “All Records” option is selected during the 6th step of the Wizard, and also that all the required recipients are selected during step 5 (the “Edit recipients list” feature in Word). 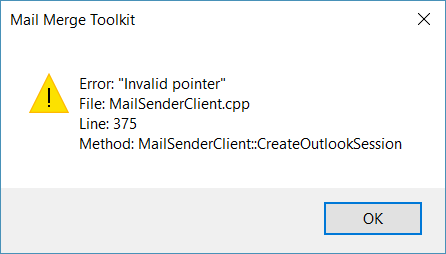 Hi, I was just about to purchase Mail Merge Toolkit when I started to receive the attached error. Can you solve this please? Hello David, thank you for your question. 1) Launch Outlook before you start mailing from Word. 3) If it is not listed among Disabled Items – please remove the tick from its check box in COM Add-Ins, click OK, then point back – and put the checkmark. That simple step will run troubleshooting – and either the issue will be fixed, or an informative notification will be displayed. Can the pdf attachment in this mail merge have an electronic signature field so the recipient can open, electronically sign, save and send back as an attachment? Thank you! Hello Sue, thank you for your quetsion. Yes, you can use electronic signature in your Word document, and it should be converted properly into PDF and supported, if you select message format: “PDF for Printing” in Mail Merge Toolkit settings. You can create a pre-made .RTF document with contents and tuned-out font settings for the message body, and then import it by right-clicking the message body editing box, and selecting the “Load from file…” menu item. I can get to the step below and then once I click ok it will not show the message dialog box. I had been able to do this previously and it has just started not going to the next step and freezing. We’ll need to check the log files to assist you on this issue. I have the same issue as Rachel.I do not get the message body menu, after click on OK in the mail merge toolkit menu. If I push on Escape button, the emails will be sent without any message body….. Unfortunately, I do not see the trouble ticket you’ve made in our Support system regarding this issue. Please try creating another one if the first one did not make it through for some reason. 2) You can see the “Manage [COM Add-ins] Go…” control down below. 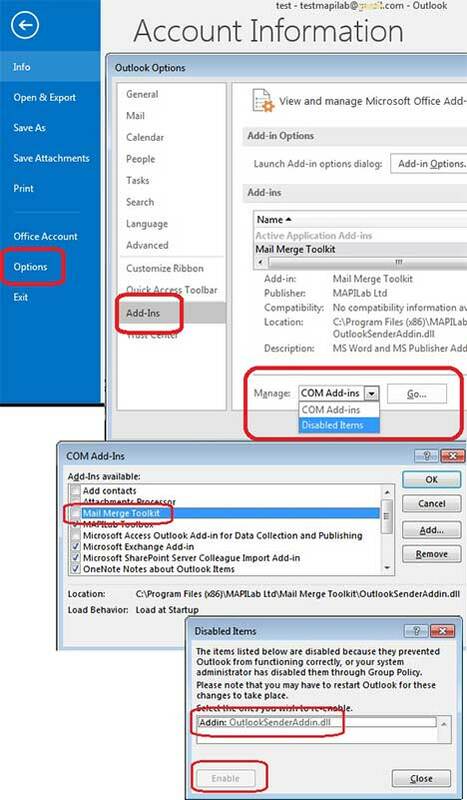 The [COM Add-ins] part is switchable. Please click it and switch to “Disabled Items” so the control would resemble the “Manage [Disable Items] Go…” scheme. 3) Click the “Go…” button. 4) On the resulting window you should see the OutlookSenderAddin.dll file. Please enable it by highlighting it and clicking the “Enable” button. 5) Next, please return to the “File -> Options -> Add-ins” window. 6) Click the “Go…” button when the [COM Add-ins] item is switched. 7) Locate the add-in in the add-ins list, and put a checkmark beside it to enable it. Click “Ok” and see if the issue has been resolved. 8) If the issue still persists, please try restarting Outlook after steps 4 and 7 for the changes to apply. If there was no OutlookSenderAddin.dll file, please remove the checkmark in the 7th step instead, and retry the procedure from the start. If I am using Mail Merge Toolkit, I would like to know if it is possible to attach all pdf files or those files with file name starting with specific strings under a specific folder. Please advise. Hello William, thank you for your question. - this way, all your PDF files from that selected folder will be attached to each message. Or, you can type path+filemask in your data source – for files in different individual folders. May I ask you a question. Does you software could be able to send mail-merge and pdf with password protection? I would like to use for sending payroll slip. We appreciate your interest in MAPILab products. I regret to inform you, but Mail Merge Toolkit does not support the password protection feature, since it relies on the original conversion algorithm Microsoft Word includes.